Rockin Star Farm is a unique waterfront and pastureland investment opportunity on the shores of Table Rock Lake in the Southern Ozarks of Missouri. Rockin Star offers over 1/3 of a mile of high-quality, undeveloped shoreline frontage on pristine Table Rock Lake. Its compelling waterfront amenity offers a classic family estate home built by Rick Ramsey, which is enhanced by the financial and amenity benefits of the water frontage, pasture, private boat dock and million dollar views. The property shoreline is flanked by a mix of oaks, cedar, pine and walnut, creating an iconic setting around the perimeter of the property. This waterfront building envelope serves as a prime location for the family estate overlooking the water with direct, west-facing views of the lake to capture brilliant sunsets. This lake shore property is ready for horses, cows, or just enjoying as a private sanctuary for wildlife. The property has walking/riding trails to get your morning exercise or to sneak into a deer stand for a quick morning or evening hunt. A custom gate welcomes you as you enter this private sanctuary and drive down the 1/2 mile paved road leading to a stunning lake home made of stone and beveled timbers, a cedar deck with dramatic lake views, commercial grade kitchen, open floor plan, massive stone fireplace, sensuous master suite, and much more. In addition, the home features GeoThermal heating and cooling, reclaimed wood floors, beams, and archways throughout. Boaters will enjoy the private permitted 2-slip boat dock. The property also includes a 48 x 60, 4-stall barn with three covered entrances, wash/grooming bays, tack and bunk rooms with fridge and half-bath, three 24 x 24 covered outdoor stalls, arena, two large paddocks, one cattle equipped. Also on the property is a historic hay barn and new equipment building. Call today to set up your own private showing of this amazing property. Video and more pictures coming soon. 303 Acres - $699,000 PRICE REDUCED!! Here's an amazing opportunity to own a large lakefront property that has it all. The property is suited for a private retreat, lake development, amazing deer and turkey hunting, fishing or just playing in Pomme de Terre Lake. The terrain rolls from gently sloping waterfront to big buck-torn ridges. Multiple food plots and new hunting stands are all in place for this year's hunting season. Don't miss the opportunity to own this great Southwest Missouri lake property! Beautiful Ozark mountain land with over 3/4 mile of gently flowing Little Beaver Creek frontage. Seventy-five percent of this property is in timber with the balance in bottom ground, river, creeks, trails, roads and grass. Great hunting overall with big bucks and long beards on this wildlife sanctuary. Some key features on property are the creek frontage, elevation changes and views of mountain tops for miles around. Don't miss this opportunity to own this farm! The Rock Hollow Ranch is a dream property with loads of character. This turnkey cattle operation will allow the new owner to produce a nice income from the property, all the while enjoying breathtaking views as he/she cruises the rolling pastures checking the herd. Previous owners have built and maintained an intensive grazing system to garner the maximum holding capacity per acre. Staying with the property is a nice sized cattle working area located atop a flat ridge for dry working and loading conditions. Also included are a large outdoor riding/roping arena and a 40 ft round pen, all in excellent condition. The 60 x 40 concrete floor barn with water and electric will also be a nice asset to the new owner. The beautiful western lodge-style earth home is a must see with top quality features, including an open beam main living area and kitchen with slate and plank flooring. The custom knotty elder cabinets feature large drawers and granite counters. Stainless commercial appliances include a designer sink, large stainless range hood, eight-burner gas range, double oven, etc. In addition, there is a whole house stereo system. The bathrooms feature granite carved vessel sinks and skylights. The front of the home features a fully covered porch overlooking a great yard with plenty of room for entertaining. Outbuildings include a 30 x 24 shop that has been converted into an apartment. Insulated, full bath, one bedroom, vaulted ceiling in living area, skylights, phone and cable. A three-sided enclosed carport also attached. A tall 50 x 32 RV garage has pull through doors for your RV. One room has been framed and covered, wired and plumbed for a bathroom and would serve well as a hunter's lodge. Five beautiful ponds, multiple streams, three waterfalls, and a cave. The Gasconade River Ranch is as rare as they come with million dollar views, cattle production to run over 100 head, trophy deer and turkey hunting and excellent access to the river, which is sure to provide hours of fishing, swimming, and canoeing enjoyment. From the moment you open the custom front door, you will be overwhelmed by the massive windows which allow for views of the river below and the beautiful Missouri Ozark Mountains. Professional stainless steel appliances and a well-designed work area will add to the pleasure of creating a culinary masterpiece all the while still being able to entertain guests and enjoy the amazing river views. The 1000 square foot master suite is designed around a single concept of pure relaxation and luxury including a sitting area, exercise room, and the continued amazing river views. The master bath offers a huge shower and a massive closet with built-ins. For your vehicles and small equipment, there is a large 3-bay attached garage and second garage on the back of the home. The finished basement area boasts one additional bedroom and a walk out covered patio. There are two additional baths, a large work room with an additional concrete 'bunker' safe room and a mechanical room, which houses the heating and cooling systems, water heaters and a host of other mechanical systems. Whether you are looking for an incredible river property, cattle production, hunting retreat or just a beautiful home in the country, this place has it all and is priced to sell. Donâ&#x20AC;&#x2122;t miss the opportunity to own this great South Central Missouri property. Call me direct for more information on this great property. Remember, buy land; they're not making it anymore. We Wish You The Very Best that 2017 Has To Offer In 2017 Parade of Homes has Exciting Plans for the New Year. New Owners with New and Fresh Ideas Focusing on Increasing Distribution & Expanding the Coverage Area. 2017 Looks to be a Very Successful New Year. 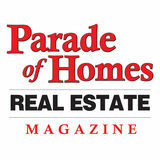 For the past 31 Years Parade of Homes Publications, Inc. has been under the ownership of Shirley LaCore. She will still be on hand for the next few months to help in the transition before she retires! Neither Publisher nor listing Broker are responsible for accuracy, misrepresentation or typographical errors, or page placement herein contained. No part of this magazine may be reproduced or republished without written consent of the Publisher. All PDF’s of our magazine are HYPERLINKED! Email addresses, website URL’s & some company logos can be clicked to go to their web pages, give it a try! Approximately 3500 acres Diverse terrain, 1200+ ac. pasture, 2000+ ac. timber, partial fenced, ponds, streams, springs, established riding trails. Approx. 5 mi. borders Mark Twain Natnl. Forest. County maintained roads through the property. Many drivable roads and trails within the property itself. Easy access to Branson, Branson Airport, Springfield-Branson Natnl. Airport, Bull Shoals Lake. #30344665 REDUCED TO $1,000 Per Acre THOUGHT: “Our goal in every aspect of our work should be to exalt Jesus Christ. The results are His.” John 12:32. Enjoy all that The Branson Landing offers in either of these two beautiful condos Choose 9510 Branson Landing Blvd. Choose10403 Branson Landing Blvd. 3 full bedrooms, huge walk-in closet, 3 full bathrooms with Jucuzzi tubs, tiled showers, 2 story with gorgous staircase. Includes a Butler’s kitchen along with formal kitchen. Over 2100 Sq. Ft. of living and 2 car parking spaces in garage. $489,900. A two bedroom, 2.5 bath, covered balcony overlooking the fountians and the town square. $339,000. Learn the rich history behind the name of this beautiful subdivision located on Table Rock Lake. Indulge yourself with great fishing, sightseeing or the numerous water activities that only living on the lake can offer. Pick your dream lot and enjoy the tranquil beauty of Table Rock Lake from your forever home. Choice lake front and lake view lots available. $49,900 and up. Is there a lake home in your future? These well-appointed 2 & 3 bedroom condos on Table Rock Lake offer the amenities of living on a lake with none of the hassles. Nearby, Branson provides entertainment, restaurants and a variety of stores for shopping. With boat slips and garages, Pointe 7 is your own slice of heaven. $229,900 and up. 'Awesome'' is the only word to describe this magnificent home that sits on 3.13 acres with a wet weather creek on the back of the property. Within walking distance to the lake. Home has 4 bedrooms, 3 full baths plus a detached apartment with its own kitchen and bath.Home was already an energy efficient Log home and sellers added SOLAR PANELS in 2016 that makes it REALLY Energy Efficient. Cedar vaulted ceiling open loft area w/hardwood floors & cedar bannister. Tall Stone fireplace w/trapezoid Argon Gas windows. New stainless appliances, Granite countertops and stone accent breakfast bar. Basement area plumbed for wet bar. Enclosed deck on back of home. List of all improvements on display at home. OďŹ&#x192;ce: 417-823-2300 cdouglas@murney.com Information regarding property is from sources deemed reliable, but no warranty or representation is made as to the accuracy thereof and same is submitted subject to errors, omissions, prior sale or lease or withdrawal without notice. Our master-planned resort continues to grow. As lodges are completed, individual condos are being sold, primarily as 2nd homes. Owners have the option of making their condos available for nightly resort rental while they are not using them. This creates an enjoyable atmosphere, with income potential for your home away from home. Rustic, log-sided lodges nestled in a secluded forest along the shores of beautiful Table Rock Lake. Just 4 miles west of the theatre and shopping district, you’re close enough to be convenient, yet far enough away to experience a true Ozark Mountain lake retreat. Located on picturesque Indian Point between 3 marinas, Silver Dollar City and championship golf. THE VILLAGE truly is the best of both worlds ... Branson AND the Lake in one magic location! Call or visit our web site for more details, reservations and rates! Welcome to Mill Creek in the beautiful Ozark Mountains just a short 10 minute drive north of the entertainment mecca of Branson, Missouri where you will find both live entertainment venues and family attractions like Silver Dollar City. Mill Creek defines “city close, but country quiet” with all Branson schools within a 10 minute drive, shopping at Branson Hills just a few minutes away, and convenient access to highway 65 corridor. Upscale home design with affordable pricing make Mill Creek a fantastic neighborhood for everyone. Homes in Mill Creek start in the low $200’s! Welcome to Whispering Meadows location in the vacation and entertainment mecca of Branson, Missouri where you will find both live entertainment venues and family attractions like Silver Dollar City. Whispering Meadows features exclusive floor plans and wide range of home styles to fit the need of any home buyer. Many sites feature full, unfinished walk out basements or convenient split level floor plans. All homes feature at least three bedrooms and two bathrooms and a two car garage. Homes are currently available at Whispering Meadows starting the $140â&#x20AC;&#x2122;s.
Welcome to Barrington Oaks in beautiful Reeds Spring, Missouri. Close to Table Rock Lake with easy access to Ozark, Nixa, and Springfield, Missouri. Just down the road from the lakeside communities of Branson West, Kimberling City, and Blue Eye, Missouri. The vacation and entertainment mecca of Branson, Missouri is a short 10 minute drive East where you will find both live entertainment venues and family attractions like Silver Dollar City. Barrington Oaks features spacious lots with three bedroom and two bathroom homes starting as low as $114,900. All homes feature a two car garage and many are available with a full, unfinished, walk out basement. of our first issue in 1987. When was the last time you compared insurance rates? Our Goal is to Save YOU Time and Money! Licensed in: • Missouri • Texas • Arkansas • Colorado • Montana • Oklahoma Service available • Tennessee in all 50 states. Log Home Estate on 16 Private Acres w/ 2 Stall Private Dock! Gated Lakefront Estate on 12.5 acre Private Peninsula! Lakefront Brick Ranch On Lake Taneycomo! Lake Cabin on 4 Acres! Rustic Cedar Lakeview Home On 10 Acres! The Premier 300 Acre Hunting Lodge On Bryant Creek! Ultra-Modern Frank Lloyd Wright Style Lake View Home On 4 Private Acres! 44 Acre Lakefront Development Land! great location for your dream! Prime commercial property on Hwy 76 in branson! Wonderful Hwy 76 Commercial Property! 10 Acre Horse Farm w/ 50x50 Shop & 1990 SQFT Apartment! Massive Lakeview Home On 2 Acres! Premier 155 acre Cattle Ranch and House! under construction! grand cru landing! 6 Commercial Office/Retail Buildings Downtown Branson! Commercial Property, Almost 400’ of State Hwy 165 Frontage! Commercial Building w/ loft in Kimberling City! Stunning 30 acre equestrian estate in the Ozarks! Incredible panoramic year-round lake view! classic architecture and a gorgeous view of table rock lake! Spectacular lake view with great in-town location! A quality built 4 bedroom 3 bath all-brick home situated on a spacious 1 acre lot with unobstructed panoramic views of Table Rock Lake. Don’t miss this rare opportunity! Print #magazines are No. 1 in reaching affluent influential #consumers. 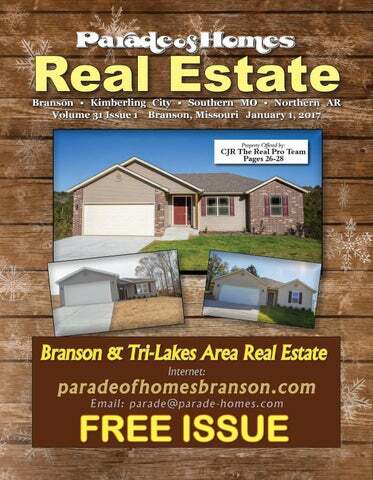 â&#x20AC;&#x153;Selling Away on Table Rock Lakeâ&#x20AC;? Welcome to The Landing at Eagle’s Nest Resort Brand New Luxury Condominiums - 2, 3 and 4 Bedrooms with Table Rock Lake Views, just minutes to Silver Dollar City. Nightly Rental Approved. Open and Spacious Floor plans, 9’ Ceilings, Custom Hardwood Cabinets, Private Decks offer Panoramic Views. Year Round Amenities – Indoor/Outdoor Pools and Splash Pads, Private Gym, Clubhouse, Owner’s Lounge, Boat/RV Parking. Elevator provides Easy Access to All Levels. Starting at $173,000. Call TODAY for more information. Living and working. Side by side. This spacious first level condo features 2 Master Suites, 3 full baths, eat-in-kitchen, formal dining area, very large laundry room with full size washer & dryer. You can watch the sun rise over the Chateau and set over the Kimberling City Bridge from two covered decks. Enjoy the Pool, Club/meeting room, Hot Tub, and Exercise Room. A 3rd Party Boat Slip is available for additional $$. MLS# 60061908 $179,900. Serving All The Lakes Area Our Goal Is Your Satisfaction! a bargain at $25,000. Great valley view! 1.05 acre , 180 degree view of Table Rock Lake. OWNER wants offer!!!! Check out our website! To view current magazine ads, visit our website! See thousands of listings, all at the click of a button! Right HOUSE. Right PRICE. Right NOW. As we Welcome a New Year I would like to take a minute to say Thank You to all my customers, friends and fellow Realtors that have helped make 2016 a successful year. It has been my pleasure to work with you! Special Note: My listings are all selling! If your considering buying, selling or just moving to a new location. Please give me a call. idelity • Commercial • Resorts • Hotels ogic • Condos • Businesses Inc.
DON’T MISS THIS ONE! Great home nestled in a popular family friendly neighborhood. Easy main level living with open dining/living area and nice windows to enjoy the wooded view. Freshly painted. Covered deck, 3BR, 2BA. Unfinished walkout lower level and a wonderful tree-lined yard. Walk to Table Rock Lake. New HVAC in 2015. Amenities include clubhouse, swimming pool & tennis courts. $175,900. Fully furnished condo with a terrific lake view. Easy walk to the waterfront from the back deck and a gentle walk to the boat slip. Two decks, available boat slip with lift and swim deck on dock. This property is in excellent condition and is a great getaway or fishing cabin/condo. Boat slip is an additional $22,000 and includes boat lift with rough water stabilizer and dock locker. Reduced! 5.28 Acres. Great building site made up of two parcels just up the road from K Dock and very near Bull Shoals Lake. 1.5 Acres. Three nice lakeview lots viewing the Virgil Bluff. Some clearing has been done, so it's ready to build your lake home. Sloped right for a walk out basement. Nice peaceful area. 3.5 & 4.5 acres LakeView! 3.5 acres or 4.5 acres with fantastic Table Rock Lake view. Ideal location for a new lake home. With some clearing lake could be visible for several miles. 13.5 Acres with 3BR, 2BA cedar-sided home. Your very own peninsula! VERY private! Awesome views of Cow Creek. Private 2-stall boat dock with 2 slips. 50.5 Acres viewing Long Creek Bridge & Beard Mt. on Table Rock Lake. Pond. Boat slip with concrete floor, swim deck & solar power available. 68.2 Acres of Waterfront Land in Popular Cow Creek Cove. Spectacular views of Table Rock Lake. Ideal for development. Surrounded by National Forest w/ approx. 600 ft. of waterfront. Very secluded. Boat launch within 2 miles. 563.36 Acres with 2.7 miles of Table Rock Lake shoreline. Red line boat dock zoning in two areas. Very secluded & wooded. 23.3 Acres Ideal location for apartments, condo's or any commercial venture. City water and sewer available across the highway. Property is across the street from OTC College. Weâ&#x20AC;&#x2122;ve added 40 NEW plans! Built Rightâ&#x20AC;&#x2122;s Mission is to build comfortable, quality homes that are affordable for working families,young professionals, and retirees, alike. Spacious Beauty with Lakefront On 3 Sides Close to Big Cedar, 8,000 sq ft, Chef’s dream kitchen, 2 great rooms with 24’ ceilings, 3 laundry areas, enormous entertainment room. 2 fireplaces, wrap around covered deck, screened-in sun room, and lots of extras including central wet vac, computerized light system, weather station, and the list goes on and on! Walk down to the water on 3 sides! On one acre with Government Take feels like 4 acres. Spacious and gracious gourmet kitchen and dining room, quality touches, amazing appliances that are only found in homes costing much more! Great home for entertaining with ample room for parking for large families or groups. Lake views from every room. Large walk-in pantry (7’ x 18’). Lower level Office with outside entrance and parking. Master bedroom with setting area and private luxury bath with double walk-in shower, jetted tub, private laundry area and gigantic walk-in closet. Built to last with steel & concrete construction! ½ mile to Lake Ranch rd.